Honey roasted peanuts are one of those simple creations that are simply divine – which is the exact reason that I never buy them. They come in large containers which somehow seem so much smaller when you sit down with them. If you’re ever in a Whole Foods that has a peanut grinder with honey roasted peanuts in it, fill the nearest 10 gallon pail and proceed to checkout because it is some of the best peanut butter ever. Otherwise, instead of trekking all the way there, just follow this embarrassingly simple “recipe”. When I was young I would only eat crunchy, but for some reason I switched 99% back to creamy. When I decided to make this simple flavor using crunchy peanut butter, it was the first time I have had crunchy PB in several years! This stuff is great on graham crackers but it’s hard to beat the spoon consumption method. It’s so simple I hope people try it! I thought I would check your blog out after reading your comments on Gluten Free Girl. Your peanut butter & honey brought back memories of when my mother would make me a snack of peanut butter w/ maple syrup mixed up and spread on graham crackers…yum. That was then, now that I have been diagnoised with Celiac I have to pass on the graham crackers or at least find some that are GF. 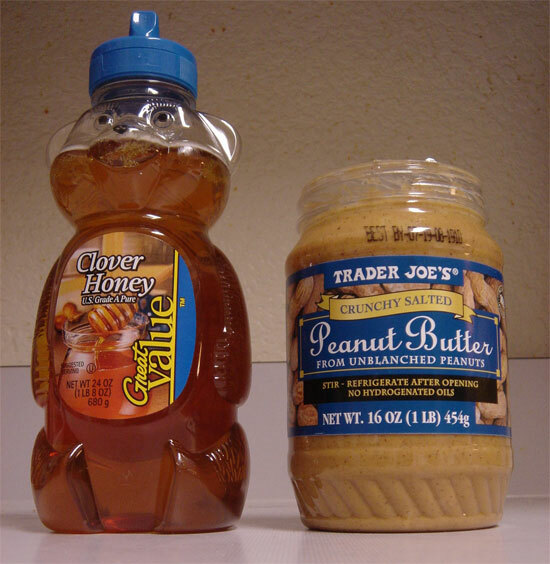 I love peanut butter, so I am anxious to dunk a spoonful into a bowl of honey sounds like the perfect GF power snack..:) Stop by my blog sometime.. Thanks for stopping by! Yes, that should be sweetened condensed milk, I just made the change! Ohio State is in Columbus. It’s nice, lots of great shopping. We are just south of Cleveland. I’m originally from Florida, so I don’t do well in these cold days! I tried some flourless peanut butter cookies one time and they were bad. I will try your recipe! Also, the pancakes. Mmmh. peanut butter and honey… I may have that this weekend. It’s me again! Can I put a link to your blog on my blog? My gluten-free..licious friends would love to check out your blog! I only tried Almond Butter once and I don’t remember liking it, although I think it was unsalted. Since then, I just can’t get myself to spend 4 times as much as peanut butter on almond butter. Almonds are superbly healthy though, but my favorite part of almonds is the crunch. What about yourself? Absolutely! I seem to have a lot of gluten-free readers now, and a lot of my recipes just happen to be gluten-free, like my Pancakes. I hope they (and you) enjoy it! Amazing what a little honey can do! Perfect time to show off your new found peanut butter skills Brenda! It tastes similar to the stuff of which we preach and the chunks add a special crunch. 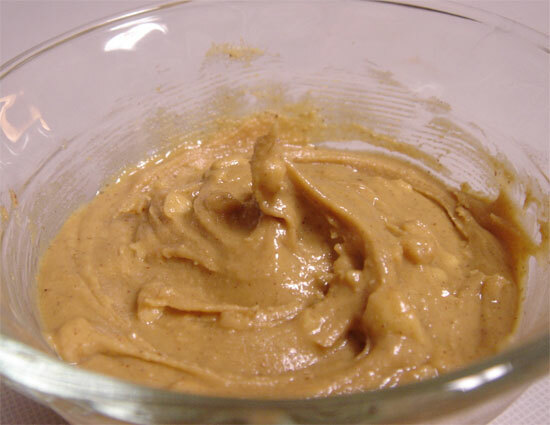 Or just find a coarse ground creamy peanut butter like Smuckers natural and use that to simulate the texture as well. I used this stuff this morning on some whole wheat challah bread, it was incredible. i usually liked regular jif, but found out there’s honey roasted flavor. also there’s cashew butter at trader joes. have you tried it? Yea the honey roasted flavors are incredible, even the Skippy and Jif ones which I dislike normally. I have not tried cashew butter mostly because I don’t like cashews. I think the cashew is the least appetizing nut of all and they tend to be a waste on me (like shrimp). Oddly enough both shrimp and cashews look fairly similar. I’ve also tried almond butter once and while I think it was unsalted, I don’t really care for it. I love almonds, but I like them whole because of their crunch! Well done Nick. My father was a beekeeper as a hobby and we regularly had peanut butter and honey on toast. It’s sort of like nature’s version of creamy caramel and is still one of my favourite things to eat. We don’t have Graham Crackers in Australia but I’m guessing they’re like our Saos or Saladas and it was only last week I slathered them with peanut butter and honey. Delicious. Peanut butter and honey on toast is wonderful. This simply saves you a step =). Meanwhile I’ve never heard of Saos or Saladas and they sound Spanish to me. I agree, that is some delicious peanut butter. Despite my hatred for Skippy, I really like Skippy’s honey roasted creamy and crunchy variety as well, but I think the Peter Pan version is even better. I need to buy it again and review it, it’s been a while. All I can remember is devouring the jar with a spoon and feeling sick from it – which is probably why I never bought it again. Peter Pan Honey Roast is the most delicious/decadent snack on Earth. Meijer sells it for $1.99 a jar, as Nick said, it’s suitable for devouring from the jar with a spoon…but just HALF a jar at a time! But who is the inventer of the roasted peanut? Good question…let’s just say it was me. my favorite PB is Peter Pan’s Honey Roast (crunchy).. addicting!! Hmmm, I think I’ve had their creamy honey roast but not their crunchy. I gotta find that one! Haha, I completely understand your enthusiasm! Skippy’s Honey Roasted is surprisingly good, one of my favorite “frankenbutters” but don’t give up on Natural just yet! Have you tried Natural No-Stir varieties like Skippy Natural or Skippy Natural w/ Honey? As for truly natural (without add palm oil), Trader Joe’s PB is very unique. I get the orange labeled one which is creamy/salted. It’s super runny, like almost the consistency of oil. But it’s great for making flavors (like this one) or my favorite: Cinnamon Raisin.